Speaking of hell, what the hell am I talking about??? A little while ago I got involved in a project that needed some hardware security testing. It was a complex system that used just about every protocol under the sun, including RF. Now RF, like other 'invisible' transport mechanisms, always gets me interested because, in my experience, once data becomes invisible, something magical happens: they forget about security. Nobody can see what's going on, so we don't need to worry about it, right? Wrong. Time and time again I've seen this... MagStripes, InfraRed, RFID, Bluetooth, Magic Moon Beams. You name it, they'll send data over it insecurely. In this case the RF was mostly standard stuff like WiFi and Zigbee, but there was also something going on in the 400MHz band, so how to take a look at what was there? This very cool device can receive on any frequency from 64MHz to 1.7GHz and fits in my laptop bag so is absolutely ideal. It also presents itself to the PC as a pseudo sound card, so is very easy to interface to. This was a fantastic bonus for me as I'm already comfortable with the idea of converting audio into data and have used the soundcard in my laptop for that purpose on many previous projects (e.g. magstripes). Radio is, almost by definition, very mysterious. You can't see it and you can't hear it, so using a soundcard is actually a very good shortcut to helping understand this completely unknown source of data. It's not intuitively obvious that it should be that way, but the human brain is very good at recognising patterns, and the soundcard not only provides us with auditory data that our ears will immediately be able to latch onto, but also visual data in the form of an editable wave file. The bottom line is that I don't understand how radio works, and I don't particularly want to - all I want is to be able to capture whatever's being sent over it and convert into something I can deal with - i.e. 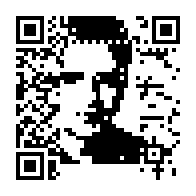 bits and bytes. So how to do that? The first task is to determine exactly what frequency our signal is on. There are several ways of doing this, and the simplest is to make a rough guess and just take a listen. If you're anywhere close you'll hear something when you activate the device, and you can then tune up or down until you've found the centre frequency and you're getting nice crisp clean signals. This is particularly important when trying to convert mysterious airy-fairy analogue signals back into nice reliable 0s and 1s, as any deviation can end up corrupting your data beyond all recognition. 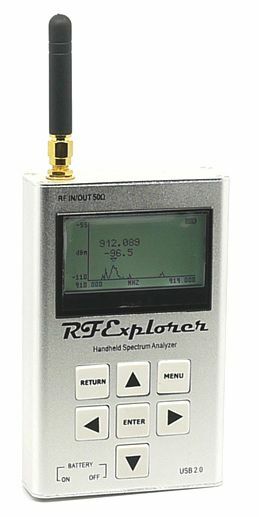 Another way is to use a spectrum analyser. This is essentially another type of RF receiver, that listens on a very wide band and shows you any spikes or other discrepancies, one of which will be the signal you're looking for. 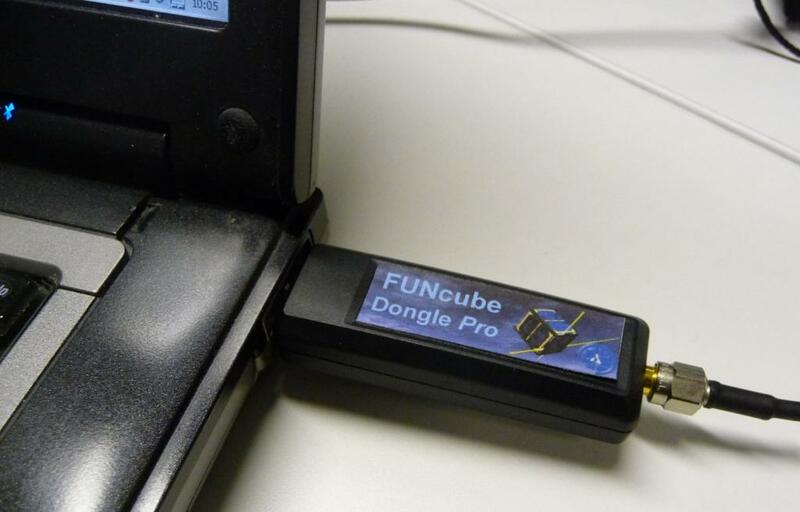 This can be in the form of software using the FunCube itself, such as HDSDR (Windows) or QUISK (Linux), or a standalone hardware device like the RF Explorer. I actually use both. 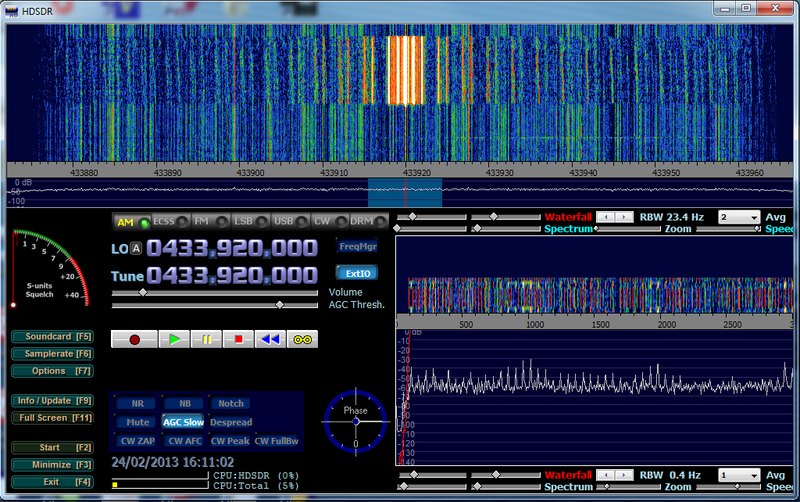 The RF Explorer to quickly find the signal, and then QUISK or HDSDR to fine tune. Like most such devices, it helpfully tells you what frequency it's using on its R&TTE approval label. In this case, 433.92 MHz. Putting that into HDSDR and hitting the button produces a nice 'hot' line right on the centre (the white and orange blob in the top window), so it looks like we're in the money... We can also hear what is obviously data. OK, so now what? 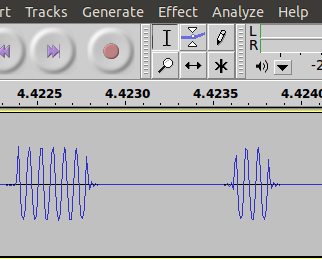 How do we get it from the sound card into nice friendly binary data? Although we've decided against using the USRP, it's companion software, GNU Radio, is the obvious choice. 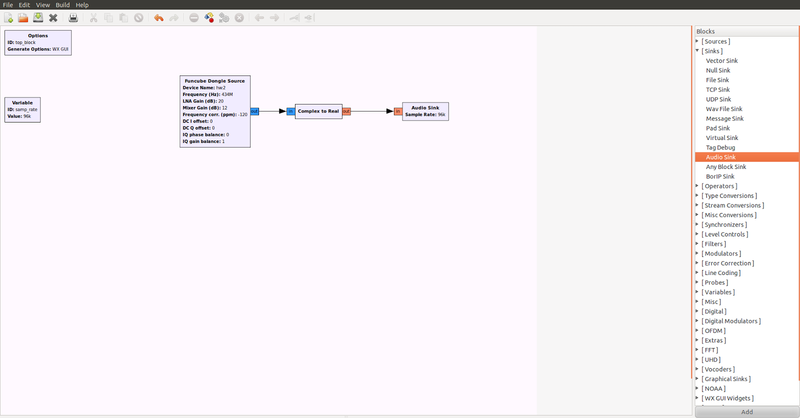 It has a great helper tool called GNU Radio Companion which makes this kind of task an absolute doddle. 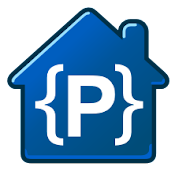 There is a plugin for the FunCube which is now bundled with the main GNU Radio distribution, so no extra work is required to get it up and running. and now this is where the fun begins. We can edit that file with any audio editor. I used Audacity but pretty much anything will do. Now I know I said I wasn't interested in understanding radio, but there is one little thing that will help to convert our data from it's current analogue form into proper digital, and that's modulation. There are many modulation schemes out there, but the two you're most likely to encounter at this level are FM (Frequency Modulation) and AM (Amplitude Modulation). FM is normally used for things that need reasonably high fidelity, like speech or music, but AM, although it can also be used for speech and music, is perfectly suited to binary data as all it needs to be is either 'ON' or 'OFF'. This is also known as OOK, or On-Off Keying, and as we can see from our sample, this is clearly what we are dealing with here. We have a flat line when we're 'OFF', which then becomes wavy when we're 'ON'. Now we know we're dealing with AM, we can get GNU Radio to do one more job for us: demodulate the AM signal. Add some leading zeros to bring it up to a multiple of eight bits and we get 00001000 00011110, which is 08 1E in hex. Of course it may actually be interpreted differently - the 0 and 1 may be the other way around, and the bit order may be reversed, but for our purposes, at this stage, it really doesn't matter as long as it makes some kind of sense. Great, so now what? 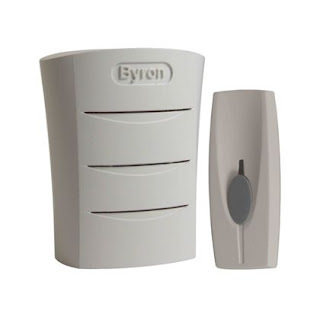 I know my doorbell push-button is spitting out '081E', so therefore the bell itself must be listening for '081E' and ringing when it hears it. My neighbour's bell-push won't set it off as it's presumably sending out a different number. But how to test this? As I mentioned, the original device we were looking at was also using WiFi and Zigbee, so we were using an Ubertooth 2.4GHz dongle to poke around with that. I knew there were chips in the same device range that did sub-GHz frequencies, so I asked Mike Ossman, the Ubertooth's designer, if he knew of any projects utilising these. I was in luck: he did. 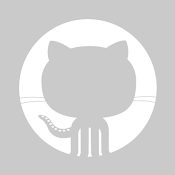 Not only had he got some fun and interesting research of his own, but he pointed me at RFCat, a new project (at the time) designed to do exactly this kind of thing. Perfect! Not only would I be able to receive the signals from the bell-push, but I should be able to emulate them as well. A traditional microprocessor controlled radio circuit would typically have a separate circuit or daughterboard for the radio portion, and the microprocessor would signal the data it wanted to send by toggling a pin HIGH/LOW. The microprocessor would be entirely responsible for making sure that the timing was correct - i.e. that it held the pin HIGH for as long as it wanted the RF to be 'ON', and LOW for the duration of the 'OFF' period. However, in these SoC devices, the radio part is all done for you and you simply need to tell it what modulation scheme you want, speed of transmission etc., feed it some data and it will do the rest. As we already know the modulation scheme (AM/OOK), that bit's easy, so now we just have to think of our original signal in terms of OOK, and what our data would need to look like to produce the same signal. Again, we need to add some leading or trailing 0s to give ourselves an 8-bit multiple, so the final number we end up with is 00101100 10010010 01001001 01101101 10110010, or 2C 92 49 6D B2 in HEX. Since it's always the same, we don't really need to understand what this message 'means', only to be able to reproduce it. Bingo! The doorbell rings and my dogs go crazy telling me there's someone at the door! Nice!!! Well, this is very cool and all, but it's not very, erm... Bond, is it? I mean, Daniel Craig isn't going to get the girl, save the world and keep Dame Judi happy by saying... "Hang on Bad Guys, I've just got to get my laptop out... plug in this USB dongle... nearly got it... just a tick... Ouch, that hurt!" What we need is something much cooler, sexier, and, well.... shiny! Something Gucci that's always right there, ready to go at a moment's notice... . But wait! What's that in the box of bits that came with my dev kit? A wristwatch? With a frikkin' transmitter built into it???? OK.... now that's what I'm talkin' 'bout! It's basically a cut-down RFCat-like firmware package that allows you to use the watch to transmit arbitrary signals. You can set it up either from the watch itself, or via the original Chronos dongle with a python helper, and then the up/down buttons on the right of the watch do the transmitting. Commands will be executed sequentially and must be combined as appropriate. It is recommended to finish with an EXIT to help conserve battery. "After the Wired article today, I've received a couple of email from people who are concerned that the USRP could be used to clone their keyfob transmitters for car alarms and garage doors. I'm not concerned, since there are already many ways to do this (just check the back of pupular science magazine). However, I am curious about it. I know that we can capture and play back any rf signal. The question is whether that replayed signal would result in the door being unlocked. I was under the impression that most of those systems allow an unlock code to only be used once, but does anyone out there know for sure?" These handy little devices allow you to control mains voltage appliances via RF. Clearly, this could have serious consequences if care is not taken when switching things on and off. What if it's an electric heater and it got shoved into a corner to vacuum the room? It gets switched back on and bingo, the curtains are on fire! Let's hope they've made the protocol nice and secure then! And the only difference between the five buttons on the remote is a few bits. I suspect, therefore, that the only difference between my remote and my neighbour’s will also only be a few bits, so it's probably not much of an exercise to figure out which ones I need to brute force to be able to go around switching things on and off at random (I've ordered another one and will check, so watch this space...).